Portions of this post are sponsored by Just for Men. I received complimentary products from the Smiley360 Blogger Program in exchange for an honest review. All opinions are my own. I used to think that guys didn’t spend any time getting ready for date night. Everyone jokes about how women are always late because we have to do our hair, makeup, pick out our clothes and so on. Guys just shower, shave and go, right? Well, if you’ve ever actually watched a guy get ready for date night, you’ll know that it’s a total myth. I once watched a Marine straight out of boot camp spend twenty minutes on his hair! What hair, you ask? Yeah, I asked the same thing. That itty bitty little bit that grew back in took longer to style than my entire 24-inch-long thick as molasses main. If your guy takes longer in the bathroom to get ready than you do, check out my date night tips for guys on how to look your best fast! My boyfriend, Sal, pretty much has these down pat. I’ve taken my inspiration from the things that he does to get ready for our date nights. So, all you guys out there, I didn’t just make them up off the top of my head. I used a real guy as inspiration, which means they’re totally doable tips. Coordinate your outfit with your date. Look, if we’re wearing a ballgown, that’s a cue that you shouldn’t be wearing jeans. If we’re wearing jeans and a pretty sweater, it means you shouldn’t be wearing a tux. We don’t want to feel either over or under-dressed. It’s okay to ask us what we’re wearing. On the flip side, if you’re planning a surprise for us, please at least tell us what YOU’RE wearing. It saves everyone a lot of time. Go with tried and true hair styles. Date night is not the time to try out a new haircut or go from a beard to a goatee. Why? Because chances are, you’ll decide it’s uneven, needs a little more off this side, a trim off that side, a little more here then BOOM, the whole thing ends up getting shaved off because you’re not happy. Just stick with your usual handsome self so we can actually get out the door sometime tonight, okay? Same goes for cologne. Date night is not the time to try out a brand new, never-been-smelled cologne. What if you hate it? What if you overdo it? You’ll be back in the shower and we’ll be waiting. Just stick with the scents we both love. Try out the new ones on a lazy Sunday at home. Shower in the morning, freshen up in the evening. Unless you have a job that leaves you really dirty or stinky, it’s okay to shower just once that day. You can “freshen up” the areas that we’ll be coming in close contact with, if you know what I mean. Wink, wink, nudge nudge. 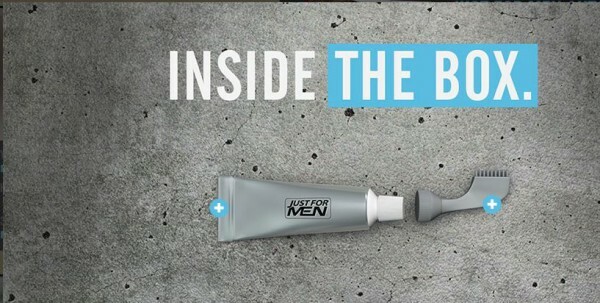 Cover your greys quick with Just for Men. While it’s fine if you want to leave your greys (there is nothing wrong with growing old gracefully), guys want to cover them just as much as we girls do. Sal is most unhappy that he’s starting to go grey, especially since he’s still in his 30s. He been a faithful Just For Men Beard and Mustache user since we did our first Facial Hair Champ post last July. Now, there’s this awesome product called Just For Men AutoStop that will help you cover your greys fast while keeping your hair looking natural. I kind of screwed up. I thought this was also for beards (it was during the crazy holiday season and I read too fast). I didn’t see anything on the box that said you could use it on beards, so we opted to not try that. As you’ve seen in the past, Sal has no hair, so I couldn’t use him as my test subject. We used his friend, who didn’t want to be shown on the site. That aside, let me tell you a bit about how Just for Men Auto Stop works. 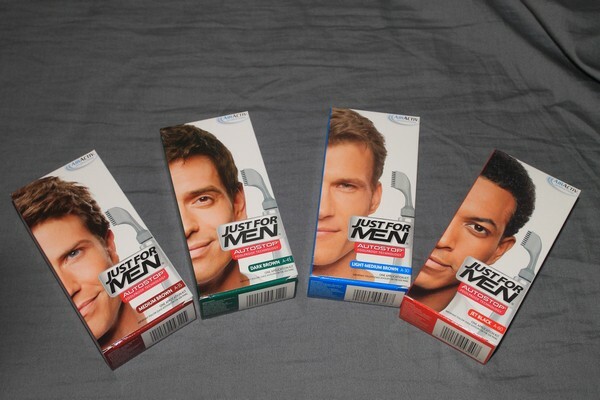 The Just for Men Auto Stop hair color kit comes with a tube of premixed dye and a screw-on comb. I’m actually super jealous of this. All you have to do is take off the cap, screw on the comb, apply to your hair and wait. After about 10 minutes, the formula automatically stops coloring, so it preserves all the color variations of your natural hair. What the heck? Why don’t we have this??? I’m crying no fair here. I want something that does the same thing to my grey roots! Hey, Just for Men, make me one please and call it “Just for Nikki.” I’ll be your best friend! Seriously, covering your greys doesn’t get any easier than that. After ten minutes, rinse, style (see tip #2) and you’re ready for date night! It really works exactly how it claims. It covers grey hairs without leaving that monochromatic look that we women are often stuck with. Grab a $2 off coupon for either the Just for Men Auto Stop or Original Formula, then give it a try. 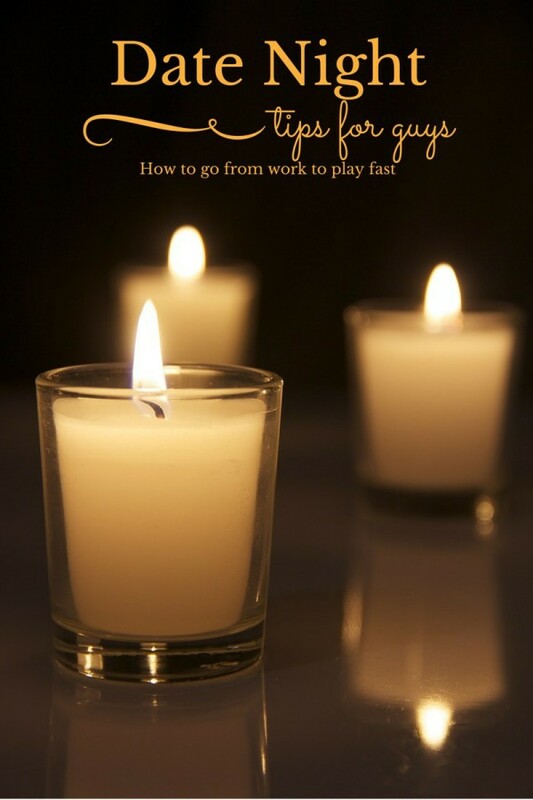 Do you have any date night tips for guys to get ready fast? Share them in the comments!